© Georg Thieme Verlag, Rüdigerstr. 14, 70469 Stuttgart, Germany. All rights reserved. This journal, including all individual contributions and illustrations published therein, is legally protected by copyright for the duration of the copyright period. Any use, exploitation or commercialization outside the narrow limits set by copyright legislation, without the publisher's consent, is illegal and liable to criminal prosecution. This applies in particular to photostat reproduction, copying, cyclostyling, mimeographing or duplication of any kind, translating, preparation of microfilms, and electronic data processing and storage. 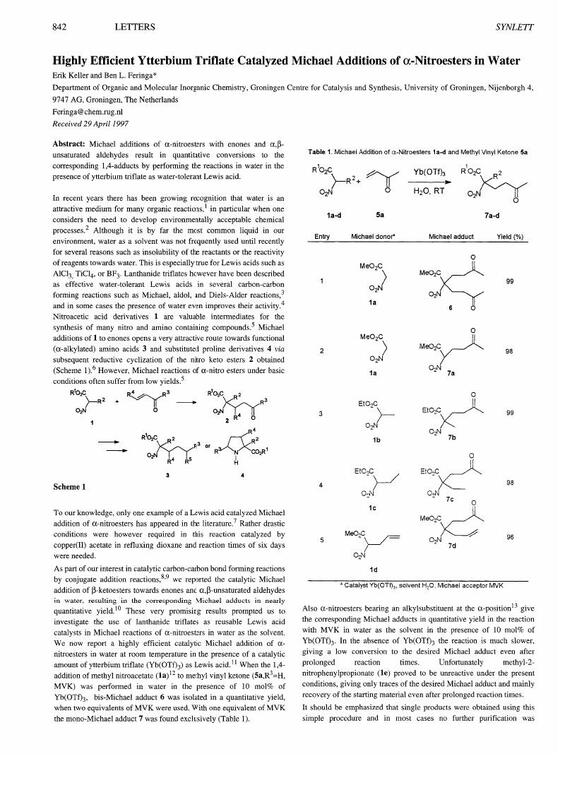 Michael additions of α-nitroesters with enones and αβ-unsaturated aldehydes result in quantitative conversions to the corresponding 1,4-adducts by performing the reactions in water in the presence of ytterbium triflate as water-tolerant Lewis acid.